Opis: Truth and Denotation - Martin R. M.
Every reflective student of language is interested in how predicates and names are related to each other and to the objects for which they stand. The study of such semantical topics has played an important role in philosophy and grammar from the Greek period to the present day. Until recently philosophical discussion of them has been intimately bound up with more general metaphysical or epistemological considerations, and semantical theory has been a branch of a broader philosophy of language. But today interest seems to focus on such theory independent of its place in any metaphysical or epistemological scheme. Semantics is now concerned with problems of a narrower kind than heretofore, but these have come to occupy a central place in contemporary philosophical discussion. Within recent years semantical theory has been tremendously revitalized by discoveries in modern symbolic logic, discoveries so fundamental that semantics has become virtually a branch of logic. Most of the important contributions to modern logic including semantics have been of a highly technical kind, and many of them have been made by professional mathematicians. Theoretical semantics might thus with justice be called mathematical semantics. But to call it such would suggest that the subject is of narrow interest and relevant only to studies in the foundations of mathematics. On the contrary, the kinds of issues with which it deals are of wide interest and are important for studies in the foundations of theoretical, systematic disciplines of all kinds. In particular, the methodology of the sciences is now pre-eminently concerned with the semantics of scientific language. Also the basic concepts of semantics are of interest for philosophy in its various branches. This book is a study in the logical foundations of modern theoretical semantics and is concerned with such notions as truth, denotation, designation, consistency, and the like. Several alternative semantical theories are to be formulated, and most of them contain some novelty, however slight, of conception or of treatment. Some of the theories formulated are perhaps new, some of them are old, and some of them are old theories formulated in a somewhat new way. No specific knowledge is presupposed on the part of the reader other than some familiarity with the most elementary logic of truth-functions and quantifiers. 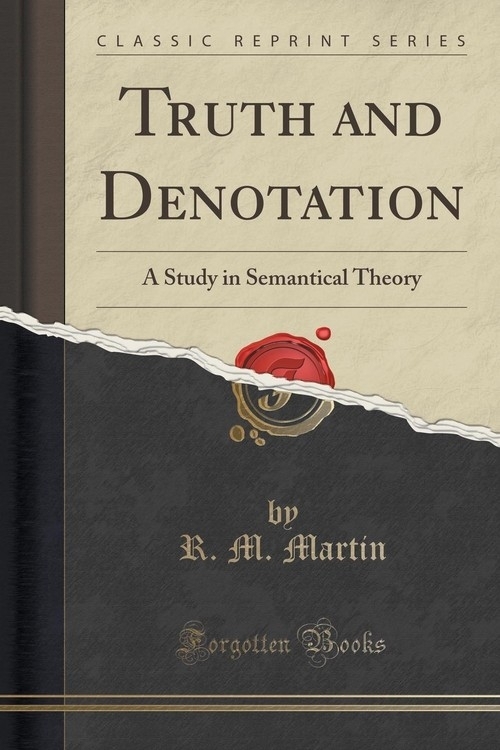 Szczegóły: Truth and Denotation - Martin R. M.
Recenzje: Truth and Denotation - Martin R. M.